WUHAN: A railway linking Wuhan in central China's Hubei Province and Guangdong's capital Guangzhou city was set for trial run on Wednesday. It took three hours for trains to cover the 1,068.6-kilometer railway, said an official with the railway bureau of Wuhan. 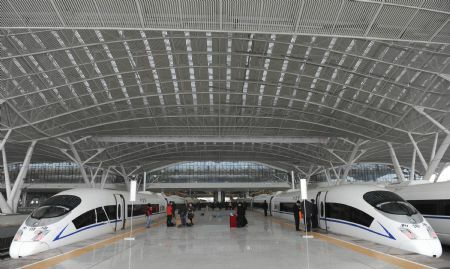 The railway costs about 116.6 billion yuan (about 17 billion US dollars) and shortens the 10.5-hour trip between Wuhan and Guangzhou to three hours. Trial operation of the railway shall start on December 20, according to the official. 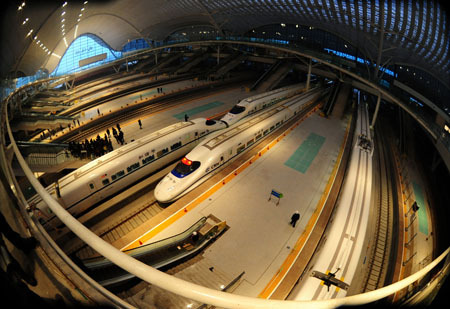 China is in a fervor of improving its railway system amid transportation pressure. 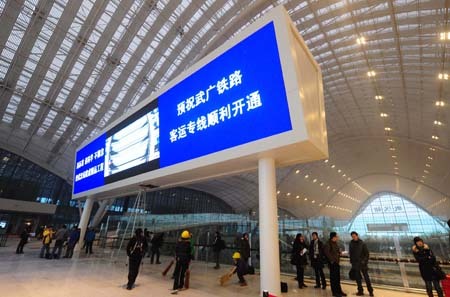 As planned, it will build 42 high-speed passenger rail lines with a total length of 13,000 kilometers in three years. Cutting down the travel time from over ten hours to only three hours would make the country feel that much "smaller". I wonder how is a CRH ticket price compares to that of an air ticket. From now on there is no more excuse not to visit with in-laws because there is not enough time, can't buy a ticket or train schedule simply is screw up. thats one hell of a fast train, thats over 350kph!!! isnt that a little too fast I thought the speed was 220kph and 300kph the fastest? plus the train will have to stop and start at the stations which should take it longer, so is the train doing over 400kph to get there in 3 hours? i just spot a crazy video on youtube . The average speed would be about 350km per hour. I suppose the cruise speed would then be 380km per hour. The news article did not go into any detail to explain the speeds of various CRH trains. I believe the main line can achieve an avarage operating speed of 350 KPH while feeder lines run at 250 KPH on average. As for the three hour travel time, I guess it would have to be "express" or non-stop service between Wuhan/Guangzhou. Faster trains are rolling off the production line next year. 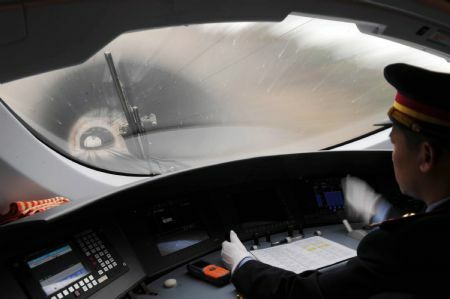 These trains will be ready in time for test runs on the 1318-km Beijing-Shanghai HSR scheduled for completion by 2011, when attempts will surely be made to breach the 400km/h barrier. 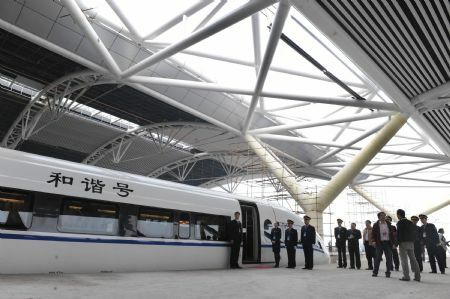 China unveiled the 'fastest' train today, officially. The run was on the 'longest' railway stretch on Earth. They experimented with a full glass of orange juice on the window sill, along with an upright standing cigarillo balanced on it's tip, just to show how smooth the ride is. The speedometer clocked 393 Km/h, it's on BBC now. attempts will surely be made to breach the 400km/h barrier. At that speed, the damn thing going faster than most, if not all, helos. Just put wings on CRH and it will fly. If what marchpole said is true, I have even less excuse. On TV or on the news website ? Not the instruments of the gentleman. The gentleman does not use them with pleasure. The gentleman does not glorify the victory. Is one as takes delight in killing. Can never be successful in winning the empire." From the book--Tao De Jing-ch.31 _ LaoZi. Well, as a matter of fact, you have no excuse as from 26.12.2009. "Reconnected" Multiple Units(MU) train increases drag by 7%. A single train composed of 8 motor coaches would have smashed the 400km-h barrier this time in a woosh. 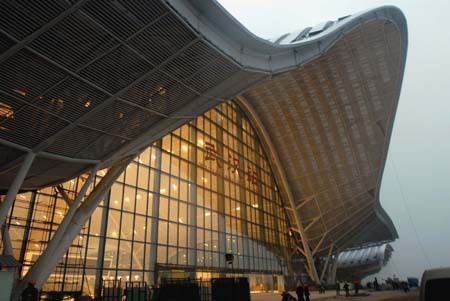 station built for the Wuhan-Guangzhou high speed railway passenger special line. photo taken on Dec. 10, 2009 in Wuhan, capital of central China's Hubei Province. People could mistake it as a international airport terminal. Now that it is here; no one would believe this is just a regional RR hub for a mid-size city in central China.